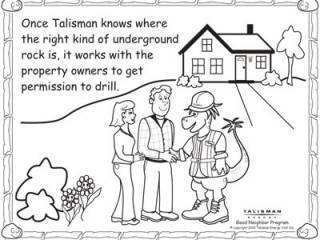 From a coloring book for kids, produced by the oil and gas industry. Ohio loves its Utica shale for jobs, economic growth and energy, but Dr. Deborah Cowden sees a darker side. Cowden is a family practice doctor who is convinced that air emissions from that drilling, especially the new large wells being fractured, or fracked, pose a big threat to site neighbors in Ohio. She shares her concerns up to four times a month at grass-root meetings across eastern Ohio. She will speak in Portage County at 7:30 p.m. Saturday at King of Glory Church on state Route 303 in Streetsboro. Cowden’s advice to Ohioans: If there is drilling within a half-mile of your house, get out and stay out as much as possible during the drilling process. Youngsters should be kept away as much as possible to minimize exposure to as many as 78 toxic chemicals in the air, says Cowden, who lives in Loudonville in Ashland County and works for the Knox County Health Department. Neighbors “need a lot of time away” to reduce possible exposures to such chemicals as cancer-causing benzene and xylene, she said. Breathing in such chemicals is harmful and is associated with an array of symptoms, she said. The fact so many chemicals are involved makes it more difficult to truly assess the health threat to individuals, she said, citing two studies of fracking in Colorado. The worst air exposures occur after the well has been fractured, when liquids are being removed in advance of production beginning, she said. “Even when everything is going right,” drilling poses a health threat to neighbors, Cowden said. Drilling is also dependent on diesel engines for pumps and for trucks that haul materials. Those fumes add to the air woes, she said. The Ohio Legislature and the Ohio Department of Natural Resources have adopted rules the state says make drilling safe. Last April, the U.S. Environmental Protection Agency approved the first federal rules on air emissions, but delayed full implementation — after the oil and gas industry complained — until Jan. 1, 2015. The new safeguards are expected to cut emissions of volatile organic compounds from drilling by nearly 25 percent and VOC emissions from new and modified fracked wells by almost 95 percent, the EPA said. They also will reduce escaped methane, the key component of natural gas and a potent global warming gas. Up to 15 percent of methane can be lost into the air, according to the industry. Cowden is also worried that pockets of hydrogen sulfide pose a deadly, and mostly ignored, threat to Ohioans. Drillers can strike pockets of the naturally occurring gas — it smells like rotten eggs — and, depending of concentrations, that can be deadly, Cowden said. “Hydrogen sulfide is a big problem in Ohio,” she said. Neighbors are at risk when drillers hit such pockets, but very little information is provided them about what to do and what not to do when that happens, she said. The gas killed a driller in 2009 at a well in Guernsey County. Cowden started looking at hydraulic fracturing after she and her husband, Greg, an electrical engineer, rejected a lease offer on their 15 acres. She was troubled by what she found and worried about the need for more medical research.